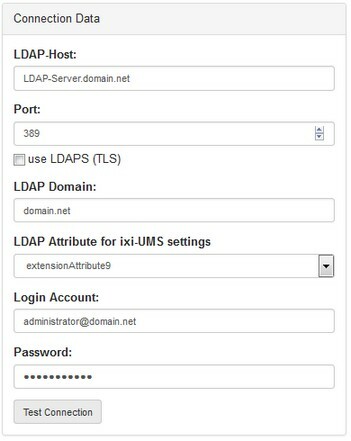 Specify which LDAP data bank for the user management should be used. User administration is performed through the user management interface built into ixi-UMS Business, regardless of the database in which the users are managed. The users from Active Directory are displayed. You must perform the ixi-UMS schema extension to store the ixi-UMS properties of the users in the "ixiumsUserData" attribute. You must create the users manually in the local database. It is not possible to read an existing database. You find detailed information in the ixi-UMS Business manual under "preparation of the installation". If you want to manage the users in the existing Active Directory, the required connection data must be entered. This informations are only necessary if you use an Active Directory. Normally the LDAP port for the Active Directory is the port 389. Type in the name of the Active Directory domain. If a Microsoft Exchange Server is in use, the attributes "extensionaAttibute 1-15" are offered for selection. If no Microsoft Exchange is used, you must select the attribute "ixiumsUserData". In this case, you must perform the schema extension. With this account the access to the data bank LDAP is carried out. Please note that write access to the Active Directory is required to enter the ixi-UMS properties.